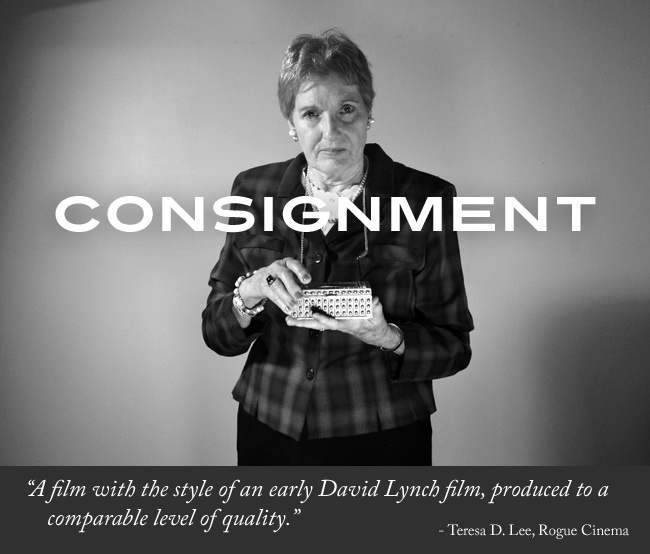 Teresa D. Lee of Rogue Cinema reviews Justin Hannah's "Consignment"
Teresa D. Lee of Rogue Cinema wrote this excellent review of "Consignment" for their May 2014 issue. Founded in 2004, Rogue Cinema is a monthly webzine featuring covering independent and genre cinema with reviews, interviews, articles and more. As brief and transient as life is, the pursuit of love can sometimes become a maddening descent into selfish coveting. Desperate singles are sometimes tempted by the fear of loneliness into venomously competitive feelings of possession of significant others. Is there anything more horrific and endangering than selecting a person as a goal to end such soul-consuming longing? Such longing can only distract an individual from developing a self-assured identity while searching for meaning in life, and any victory hinges upon the appraising judgment of the prized other.